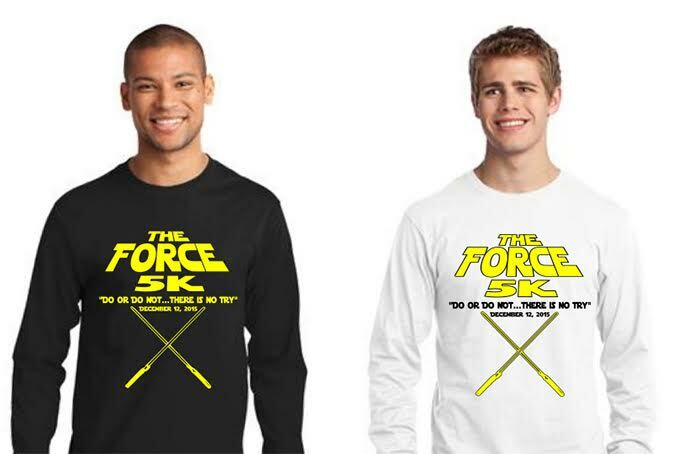 Course Info: Pick your side...Dark Side or Jedi and that determines which ROUTE you run! YOu'll encounter the other side along the way! ON the paved paths of beautiful Little Mulberry Park. Awards: "Do or DO NOT...there is no TRY" Pick your side, the Dark Side or the Jedi and join us on Saturday, December 12th in anticipation of the Star Wars premier! Trophies and light sabers given to the top overall male and female winners as well as Masters Male and Female winners. Medals to the top three in male and female five year categories from 10 and under to 65 and up. Pick your side and determine which color long sleeve shirt you'd like. (Black or White) Dark Side and Jedi will start in different locations and run in opposite directions and encounter each other along the way!! Photo ops with Characters before the race as well.